The Termas de Rio Hondo circuit in Argentina offered up a tense and excitable atmosphere on Sunday with its many passionate fans. 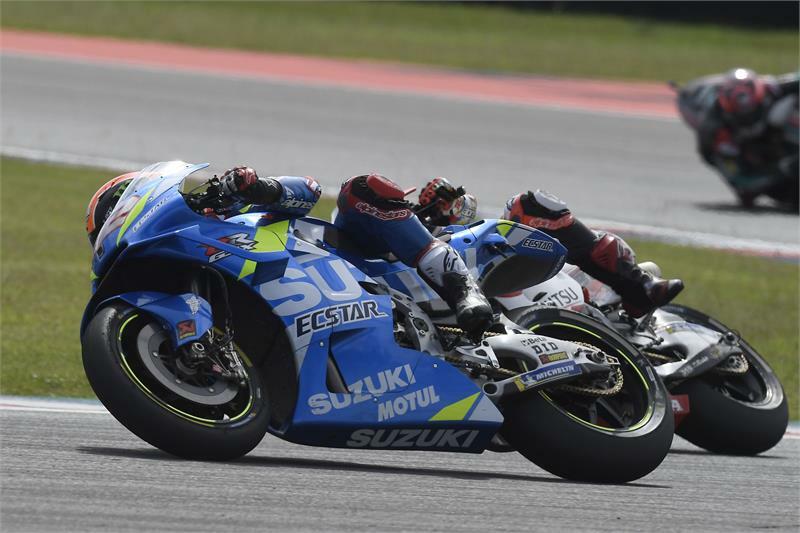 Alex Rins and Joan Mir had a tricky task ahead of them after struggles in qualifying, but the determined duo showed improved pace in the morning warm-up. As the lights went out, the track temperature rose to 41c and tyre longevity was set to play a key role in race management. A steady start from Alex Rins saw him hovering around the Top 12, whilst Joan Mir after a good start progressively dropped down to 17th in a couple of laps. Highly motivated to take a strong result at one of his favourite tracks, Rins didn’t let up and continued a push through the field. The Spaniard had already gained six places on his grid spot after seven laps. After setting a best lap, Alex found himself fighting within the lead group with 10 laps to go. Keeping his head and riding smoothly, Rins fought his way towards podium contention and eventually took an excellent 5th place. Meanwhile, rookie Joan Mir got away well but soon suffered with severe lack of feeling and grip on the rear tyre. As the 25 lap race neared its conclusion, Joan was forced to pull into pit lane, and he unfortunately retired from the Argentinian GP.